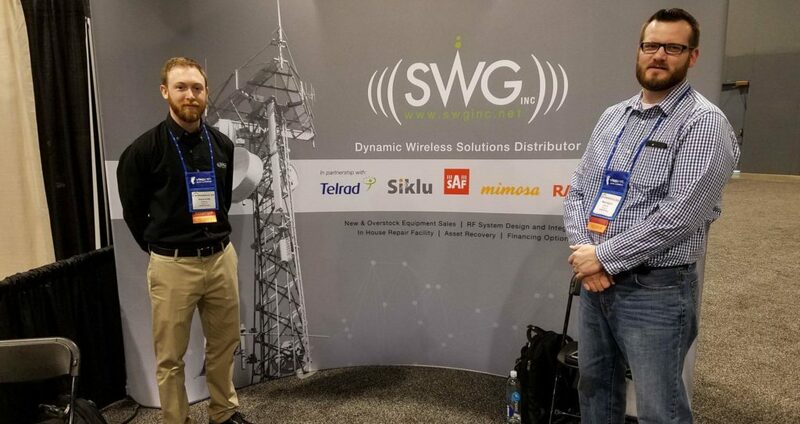 SWG, Inc.’s Time at WISPAMERICA 2018 | SWG, Inc. Earlier this month, SWG, Inc. was proud to be a part of the latest WISPA event – WISPAMERICA 2018. This event’s goal was to bring WISPA members, internet service providers, industry experts, and the leading suppliers of wireless gear together for three days of education, inspiration, technology demos, and networking. This year’s WISPAMERICA took place in Birmingham, Alabama and was one of the largest WISPA events of the year so far. SWG, Inc. was one of the 85 vendors that were invited to participate as an exhibitor. Members of our team met with some of our current clientele, while we were able to spread our knowledge of the wireless industry with new customers from around the globe. Our experts spoke to both current and new customers about point-to-point and point-to-multipoint network needs and how they can improve their enterprises. We also focused on our new products and how their capabilities can improve network connections. During the three-day WISPA event, there were multiple informational sessions in the fields of business, technical, marketing, financial, human resources, and infrastructure. There were four major points that the event focused on, which included technical training, business strategies, sales and marketing, and human resources. For those who are unaware, WISPA is the Wireless Internet Service Providers Association, and WISPs are the organization’s 800-plus wireless internet service providers. WISPA promotes the development, advancement, and unification of the wireless internet service provider industry. If you are interested in learning more about WISPA or interested in becoming a member, check out their website. And if your enterprise is interested in attending the next event, check out their schedule of upcoming events. As a proud WISPA member, SWG, Inc. is happy to serve the needs of the wireless world. Our team was so proud to be involved in the event, and we look forward to the next one! If you are interested in learning more about the new Mimosa B24 or any of our other wireless gear, contact our experts today.